Let's get right to it: Is there a small voice deep inside you that whispers horrible things like these? Do you secretly worry that everything is going to fall apart on your watch — no matter how hard you work or how much you accomplish? Do you envy other people who seem to be able to enjoy their own achievements and celebrate their success? Is your schedule jammed full of deadlines and events and expectations… but you feel adrift and alone? Have you pushed your worry down and told yourself, If I just work harder, I’ll finally feel worthy? These are real, valid feelings. And they’re poisonous. If you don’t stop this kind of thinking in its tracks, it can seep into every part of your one, precious life. These thoughts can keep you from ever knowing that the endless work you put in — to reach your goals at work, to give your family the best life you can, to become the version of yourself you want to be — is ENOUGH. When the chips come down, do you really want to keep living this way? You deserve to feel like YOU are enough. ENOUGH: Your Daring Year is a 12-month group coaching program for people who desperately want to cultivate a mindset of self-appreciation, focus, and resilience. Together, we’ll banish those painful, useless voices that mock and distract you, and begin your journey of living your real worth. You and your fellow ENOUGH group members will practice self-love and self-compassion. You’ll learn to act from a place of mindfulness and bravery rather than fear and expectation. What will ENOUGH open for you? ENOUGH: Your Daring Year is a year of discovery and self-transformation. ENOUGH is more than a purely intellectual exercise. It’s practical tools, tailored information, and personal guidance to help you break free of the thoughts and feelings that are holding you down and making you feel less-than. You’re here because you’re an overachiever. You’ve pursued accomplishments and accolades and education your whole life. Excellence is your baseline, but somehow it’s never felt like, well, enough. This way of living, this giving and giving and giving… it’s exhausting. It’s frustrating. You see others (who prooobably aren’t working as hard as you are) celebrating their own successes, and you think to yourself… What do they have that I don’t? The ENOUGH group coaching program is a place of belonging and connection. Think of it like an incubator for your personal and professional growth — a safe, motivating place to figure out what’s getting in the way of your own fulfillment, and move those roadblocks. Who will your fellow ENOUGH members be? With 11 others, you’ll identify what's getting in the way and implement practical steps to remove those obstacles. Your group mates will be lawyers, realtors, dental hygienists, educators, PR specialists, executives… They’ll have different careers and lifestyles than you, but you’ll be united by one thing: the knowledge that you deserve to be your own best friend and #1 advocate. Many ENOUGH “graduates” stay connected and continue to support each other after the program ends. You’re joining a 12-month coaching program, but you might just end up making friends for life. Your daring year won’t be comfortable or perfect. You’ll go through some serious shitstorms in order to find what truly works to cultivate the life you want. The fantastic news? You won’t ever go through it alone — you’ll be walking right along with your fellow ENOUGH members. This work is never over, but it becomes easier and more fulfilling the more practice you get. All you have to do is start the ball rolling. How does ENOUGH: Your Daring Year work? We’ll start with a 2-day online retreat, where we’ll build a foundation for our year together. You can be anywhere in the world to participate. Just grab your favorite beverage, hop into a comfy chair, and bring your open mind to our kickoff retreat. After our 2-day online retreat, your group will meet twice a month for the rest of the year. You’ll realize you are not alone. You’ll see yourself and your struggles reflected in others’ challenges. And you’ll be inspired by the improvements and practices that other ENOUGH members cultivate. 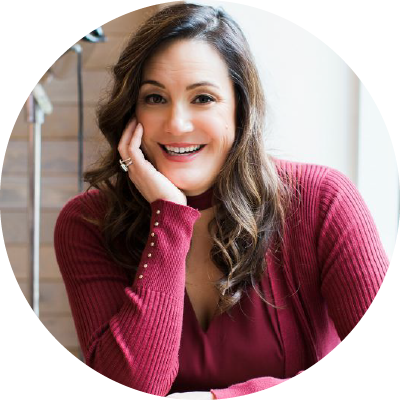 On top of the 2-day online retreat and the group coaching sessions, you’ll also have 6 personalized, private 1:1 coaching sessions with me, Koren Motekaitis, during the year (scroll down to learn more about me.) These sessions are our chance to go deep and tackle the beliefs and practices that are holding you back — both the ones you already acknowledge, and those that are so embedded, you’ll be surprised when I point them out. Your membership also includes an optional 3-day Bonus Live Retreat… but more on that later. Group coaching is effective for so many reasons — and it’s more personal than you might think. You may not be in the “hot seat” on all of our coaching calls, but you WILL benefit from hearing about and helping with your fellow members’ struggles, questions, and approaches. One recent ENOUGH member pointed out that it can even feel easier to approach and move past your own roadblocks in a group setting, because those same problems aren’t so challenging when you see them in others. Plus, your coaching group mates will ask questions you were too scared to ask, or hadn’t even thought of. And by supporting others as you work through the program, you’ll deepen your own compassion. When you join ENOUGH, you’ll get continuous, personal support to boost your growth over our 12-month program. Join your group right from the comfort of your home. No planes, trains, automobiles or hotels required! We’ll spend 2 days identifying our problems and limiting thoughts, deciding what to work on, and creating a plan for our first few group coaching sessions. Every 2 weeks, we’ll hop on Zoom for an hour-long call together. These structured, guided calls will include time for everyone to share and discuss their progress. All calls will be recorded, so if you’re unable to make a couple, you can watch them later and get everything you need. Your ENOUGH membership includes 6 private 1-on-1 coaching sessions with me, Koren Motekaitis. These are personalized deep dives crafted just for you. This is your space to connect with every person in the program. Our year together includes being a completely secure vault for each other. We all pledge to honor the trust of this community and be a vault for the stories shared in ENOUGH. Your ENOUGH membership also includes an optional, 3-day in-person retreat. Join us in person in Davis, California, and spend 3 fulfilling days systematically outgrowing your limiting perceptions of yourself. You’ve suffered from feeling inadequate for too long. Isn’t it time to truly, deeply enjoy your life — instead of just forcing through it? My name is Koren Motekaitis. I’m a master certified life coach and a trained Daring Way™ facilitator, the incredible program based on the extensive research of Dr. Brené Brown. For the past 10 years, I have worked one-on-one with hundreds of clients in the areas of shame, self-love, self-compassion, and the cultivation of belonging in their life… while letting go of the ruthless pursuit of perfection. How do I choose who will join each cohort of ENOUGH? My goal is always to ensure that every member of the ENOUGH group coaching program is a good fit for the group. After all, we’ll be spending a year learning and growing with each other! To determine whether it’s a fit, I personally conduct a coaching consult with each potential candidate. I’m 100% committed to a great year for all members of ENOUGH. The ENOUGH coaching program is not for everyone. This premium group coaching program works best when it’s filled with humans who are committed to doing this work. Who are ready and willing to commit themselves to cultivating the lives they want. Who feel, deep down, that it just might be possible to begin living from from a place of comfort and self-fulfillment. Is ENOUGH just for women? No. ENOUGH: Your Daring Year is open to humans of all identities who struggle with never feeling like they measure up. That said, many past ENOUGH group members are women… and maybe that says something about the way women are culturally programmed. Does group coaching really work? In a word, yes. Group coaching is effective for so many reasons, and not just because it allows you to work with me at a lower cost. You may not be in the “hot seat” on all of our coaching calls, but you WILL benefit from others’ struggles, questions, and approaches. Your coaching group mates will ask questions you were too scared to ask, or hadn’t even thought of. And by supporting others as you work through the program, you’ll deepen your own compassion. Yes, if you’re willing to work for it. ENOUGH is a mix of structure and flexibility that makes the program well-suited for a range of personalities and professions. As with anything, the more thought and effort you put into tackling the challenges we identify, the more positive impact you’ll experience. Enrollment for ENOUGH opens 2-3 times a year and is capped at 12 people — AKA spots are very limited. Enrollment is closed while the current group goes through the program, so I can focus my attention on them. I can’t tell you how excited I am at the possibility of working with you to help you fully realize and believe that you’re ENOUGH.